The Cygnus spacecraft carrying the 23 SSEP Mission 3b and Mission 4 experiments was captured by Canadarm2 at the International Space Station at 6:08 am ET, Sunday, January 12, 2014. 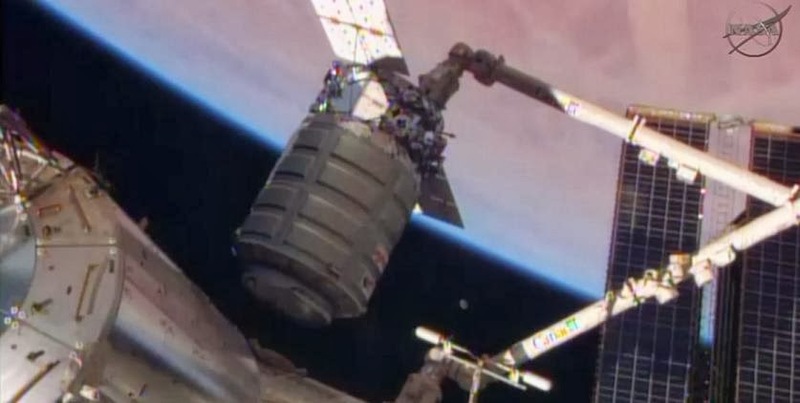 Cygnus was berthed at the Station’s Harmony node at 8:05 am ET. The Mission 3b Falcon II and Mission 4 Orion payloads were transferred to station, and 10 of 23 experiments were activated between 7:20 am and 7:40 am ET, Monday, January 13, 2014, by astronaut Koichi Wakata. January 13 is therefore designated as day Arrival =0. On January 15, designated as day Arrival+2, three more experiments are to be activated and two will be de-activated. Below is the NanoRacks communique received by the Arthur C. Clarke Institute for Space Education, and the National Center for Earth and Space Science Education at 10:25 am ET, January 13, providing the details of these on-orbit activities. The Center then posted all details on the SSEP Mission 4 and 3b to ISS: Experiment Log page, and alerted all student flight teams by 12:12 pm ET. Details of activities on ISS were therefore communicated to flight teams less than 5 hours after they occurred. Flight teams are using the information provided on the Log page to carry out concurrent ground truth experiments. Conducting identical experiments on the ground is critical. Once the flight experiment is returned to Earth, an analytical comparison with the ground experiment allows the role of gravity to be assessed for the physical, chemical, or biological system under study. Science Status: Koichi Wakata activated the following NanoRacks Mixuture Tubes on orbit today. S/N 1010, Tube 3: Does microgravity affect the growth of a Glycine max plant? S/N 1010, Tube 5: How does bacterial growth and subsequent decay of enamel on pig teeth differ in a microgravity environment compared to on Earth? S/N 1011, Tube 2: What Are the Effects of Creation of Beer in Microgravity and is it Possible? S/N 1011, Tube 5: The Effect of Microgravity on the Oxidation of Metal Exposed to a Salt Water Solution differ in a microgravity environment compared to on Earth? S/N 1008, Tube 4: Will Microgravity Alter the Regeneration of Dugesia Tigrina? S/N 1011, Tube 6: How does microgravity effect the mold growth on bread? The Smithsonian National Air and Space Museum, Center for the Advancement of Science in Space (CASIS), Carnegie Institution of Washington, NASA Nebraska Space Grant Consortium, and Subaru of America, Inc. are National Partners on the Student Spaceflight Experiments Program.